Get your spare change ready!! This week (Oct 15-19) is our Duct Tape Fundraiser. Kids can bring in spare change each morning (Mon-Th) to put in jars corresponding to one or more of the teachers below. The teacher with the most coins by Thursday morning gets duct taped to the wall alongside Mr. Gatz! The week culminates in the big event on Friday, October 19th, during lunch. 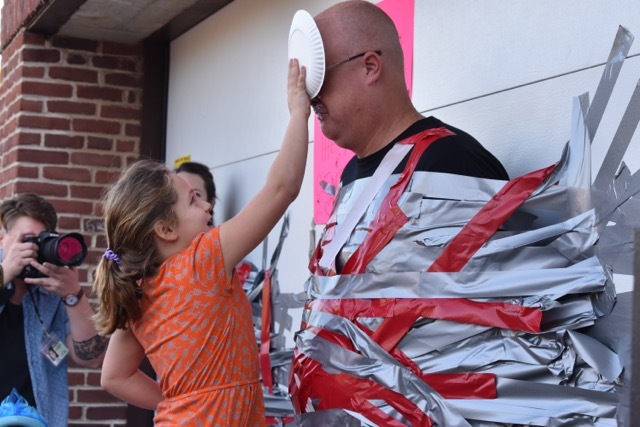 Duct tape strips will be available (2 strips for a dollar) as well as “pie in the face” chances ($20 each)—you can pre-purchase the pie chances, so send those kiddos in with whatever funds you’d like to contribute. We will be there each morning to collect any funds that come in for this. Won’t want to miss that!! Please help support this important fundraiser—all proceeds will be donated to Northwoods Park Middle School in North Carolina, which was devastated by the recent hurricane there. Last year we raised more than $1000! Special thanks to the teachers below who have agreed to participate. The PTO also needs some volunteers to help support the event during the lunch hour on the 19th, and you can sign up for that here.